The Pahrump Valley Trojans wrestling team received its first test of the season at the Boulder City Duals on Saturday and wrestled four teams. The team went 3-1 losing only to the powerful Division-1 Foothill squad. Trojans Coach Craig Rieger believes his team performed well at the tourney by winning the first two matches. “It was good. We opened up with Moapa and beat them. The second team was Sierra Vista. They had a few forfeits. Foothill we knew was a good program and they did a good job to beat us,” he said. After losing to Foothill, the Trojans went and wrestled teams on the other side of the pool. On the other side, there was Boulder City, Faith Lutheran, Del Sol and Durango. Rieger said Boulder City and Faith Lutheran were the two toughest teams. 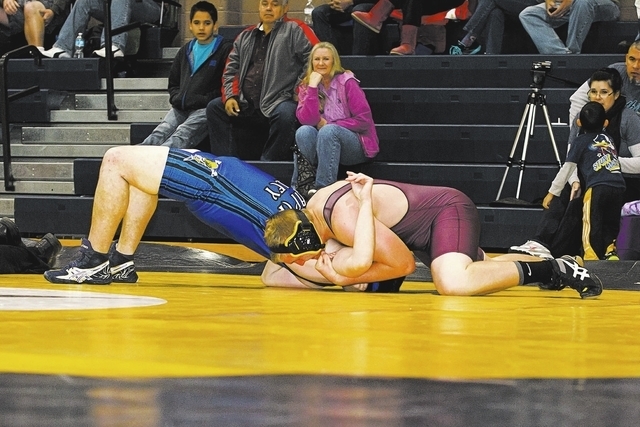 Boulder City beat Faith Lutheran, so this meant Faith had to wrestle Pahrump. “We wrestled Faith Lutheran for third and fourth. We beat them pretty well. We beat them last year, but they had different kids. I told the team before the match, ‘this is the last round of the day and this is where you bring it,’” Rieger said. Rieger believes his team to be a well balanced team. This week his upper weight classes did a good job. “My upper weights had a good day. My wrestler of the week is Sam Tucsnak. Sam Tucsnak this whole year has worked so hard in football and wrestling. He comes out and he is so aggressive. This was his first varsity wrestling matches and he went 4-0. He was aggressive and he attacked. We have a lot of good wrestlers and Sam just is a good kid.” the coach said. Junior Sam Tucsnak is in the 152-weight class. He said his toughest match came early on in the day. “My toughest match was probably against Foothill. It was the only time I got taken down,” he said. Tucsnak will probably not stay at this weight. “I will put on 20-30 more pounds on for football next year,” he said. He enjoys wrestling because of the challenge and works hard at his wrestling. “If you are in good shape it’s cool to work hard every day. I dropped 20 pounds after football. I eat a lot of fruit and vegetables and peas and chicken at night and I still work out with weights after practice too,” Tucsnak said. Scott Maughan was brought along to the duals despite losing his varsity spot in the 170-weight class. He was out-wrestled by Abraham Preciado Castro during a team wrestle-off. The wrestle-off procedure is used by high school wrestling teams to determine who will represent the school in each weight class. A team can only have one representative in each class. Rieger got Maughan some matches by finding a spot on the Faith Lutheran team. They had a hole to fill so Maughan filled the spot and went 3-0. Scott Maughan said one of his victories came against teammate Castro. “I actually think Abraham will go to 160 next week. I plan on staying at 170. I will just keep going. I wrestled Abraham and beat him. Afterwards he said he will see me at wrestle-offs. If he does drop then I won’t be wrestling off with him,” Maughan said before practice on Monday.